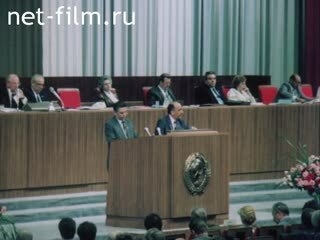 About the Congress of People's deputies of the USSR and elections to the the USSR Supreme Council. 1-5. Materials 1 Congress of People's Deputies. Alternate Chairman of the Supreme Soviet elections. 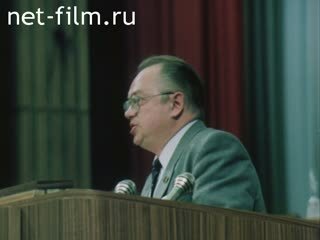 Speeches Deputies Mikhail Gorbachev, Anatoly Sobchak, E. Vlasova, Kassian, Kazannik, Yeltsin, GH Popov Bunich, Chernichenko Shmeleva). Interview Deputies V. Yaroshenko, Obolensky. Yeltsin's speech at the rally. 5-8. Speech at the congress, Mikhail Gorbachev, Academician Sakharov, international soldiers Chernopisskogo, Ochirova (about Afghanistan), Gdlyan, Sukharev, Yasmin (about the Uzbek case), Likhachev (of culture), Gamkleridze Rodionova (of Tbilisi). Withdrawal from the audience members Baltic. Speech Pruskene, Rasputin. General Secretary of the CPSU Central Committee Mikhail Gorbachev speaks at the opening session of the First Congress of People's Deputies of the USSR with the proposals for the agenda of the Congress (synchronously) - LS., MS.
Gorbachev consults with members of the presidium of the congress - LS. 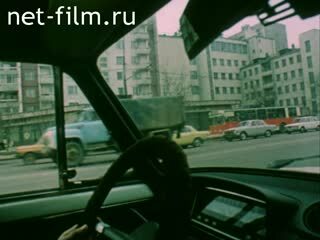 On the streets of Moscow, passing cars, driving a deputy of the Supreme Soviet of the USSR V. Yaroshenko - CU., MS. The street VN Yaroshenko interviewed about running for parliament and the election (synchronous) - CU. In the office of the interview gives rival Yaroshenko Election AI Kanaschenkov (synchronous) - CU. V. Yaroshenko driving a car - CU., PNRM. The people on the street near the wording "Moscow News» - MS.
Gorky Street, a banner over the street with the inscription: "Perestroika, democracy, transparency» - LS. MPs are at the Convention Center - LS., CU., MS.
MPs on the sidelines - CU., MS., LS. Ryzhkov of the deputies on the sidelines - MS.
MPs in the meeting room - LS. MP AM Obolensky talks to Mikhail Gorbachev, who sits on the podium - MS.
MPs listen - CU., LS. AM Obolensky in the hall - CU. 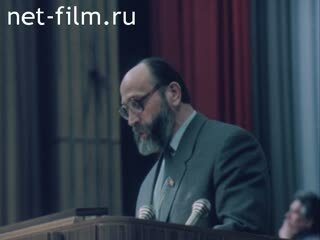 Gorbachev read out an appeal to the Congress MP MS Obolensky on the nomination as an alternative to his candidacy for the post of chairman of the Supreme Soviet of the USSR (synchronous) - MS.
MPs applaud - CU., MS.
AM Obolensky of the floor (synchronous) - CU. MP stands AA Sobchak about candidates Obolensky (synchronous) - CU. MPs on the sidelines - LS. MP AM Obolensky gives interviews (synchronously) - CU. Gorbachev surrounded by deputies, answers questions (synchronous) - LS., MS.
Conference Room, serves member poet Yevgeny Yevtushenko on the nomination to the Supreme Soviet of the USSR (synchronous) - MS., CU. MP stands Yu Vlasov (synchronous) - CU. MPs listen to - MS., CU. MPs have microphones in the audience asked for the floor - MS.
MP goes to the podium N. Kasyanov, advocates (synchronous) - MS., CU. MPs laugh - MS., LS., CU. Boris Yeltsin at a rally during the election campaign, the people around Yeltsin - MS.
Boris Yeltsin of the floor of the Congress (synchronous) - CU. MPs on the sidelines - MS.
MPs on the sidelines - CU., MS., PNRM. On the sidelines of the deputy Yaroshenko is interviewed about his relation to the procedure for elections to the Supreme Soviet of the USSR and the new composition of the Supreme Soviet of the USSR (synchronous) - CU. Conference Room, serves member Kazannik a proposal to withdraw his candidacy in favor of Boris Yeltsin (synchronous) - CU. MPs listen - LS., MS., CU. 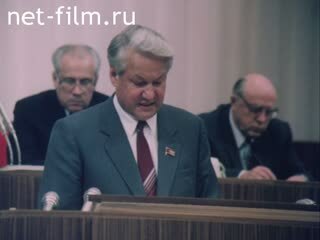 Boris Yeltsin in the hall - CU. MPs shake hands with the deputy Kazannik, Yeltsin and Kazannik shaking hands, signing autographs Kazannik - MS., CU. In the Kremlin deputy Kazannik interviewed crew (synchronous) - CU. MPs listen, applaud standing - CU., MS., LS. Rallies around the country, the people discussing the newly elected Supreme Soviet of the USSR - MS., CU. Deputy Yuri Afanasiev addresses Congress criticized the newly elected Supreme Soviet of the USSR (synchronous) - MS., CU. Gorbachev on the podium listening to soothing Hall - MS.
MPs standing applause - LS. Chairman of the Supreme Soviet Mikhail Gorbachev of the Presidium of appeals to MPs asking for the exchange of views (synchronously) - CU., MS.
MP stands by GH Popov criticized the newly elected Supreme Soviet of the procedure and the election (synchronous) - MS.
MPs listen to - MS.
Director of the first acts of the Moscow Watch Factory MP Samsonov (synchronous) - MS.
GH acts Popov (synchronous) - MS.
At the podium smiling Gorbachev - CU. Samsonov in the hall - CU. MPs applaud - LS., PNRM. MP stands LG Bunich on methods of restructuring and cost accounting (synchronous) - MS., CU. MPs listen, applaud - different. Acts journalist, deputy Yuri Chernichenko criticized perestroika (synchronously) - CU. Continues to advocate Yuri Chernichenko (synchronous) - MS., CU. MPs listen, applaud - MS., CU. MP stands Shmelev (synchronous) - MS., CU. MPs vigorously applauded - MS., CU. On the podium, Mikhail Gorbachev: a speech in defense of perestroika (synchronously) - MS., CU. The deputies of the floor, among them - Metropolitan Alexy and A. Lukyanov - CU., MS.
On the podium MP SB Stankevich - LS. On the podium deputy Yaroshinskaya - CU. MP speaks from a place - MS.
One of the deputies arguing with Mikhail Gorbachev - MS.
Acts Mikhail Gorbachev (synchronously) - CU., MS.
An Afghan soldier stands Chervopissky MP criticized the Academician Sakharov (synchronous) - MS., CU. Deputy Chervonopisskomu help to get off the podium (he prostheses) - LS. 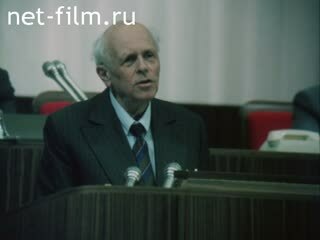 With an angry demonstration against the war in Afghanistan to MPs drawn deputy Andrei Sakharov (synchronous) - MS.
Deputies in the hall noise, applause drowned it Sakharov - MS., LS. An Afghan soldier stands deputy Ochirov (synchronous) - MS.
MPs applaud - MS., LS. People on the streets of Moscow - MS., PNRM. Editor CSDF B. Panasyuk the streets of Moscow interviews passersby about the Congress (synchronous) - CU., MS.
People on the streets - CU., MS.
People on the streets of Moscow - different. Muscovites reading newspapers on the street near the wording "Moscow News» - CU. Muscovites at a rally in support of the deputies TH Gdlyan and Nikolai Ivanov - MS., CU. Deputies in the hall at the meeting at the time of elections, the chief prosecutor of the USSR - LS. On the podium MP TH Gdlyan: Ask the candidate for the vacant position of the Prosecutor General of the USSR A. Ya Sukharev (synchronous) - MS.
AY Sukharev answers questions (synchronous) - MS., CU. Mikhail Gorbachev interrupts TH Gdlyan (synchronous) - MS.
MPs listen to - MS., CU., LS. Yarin MP proposes to establish a commission to investigate the activities of Gdlyan and Ivanov (synchronous) - MS.
Acts Academician Likhachev MP (synchronous) - MS.
People on the street - LS., CU., MS.
Near hotel "Russia" people talking to deputies - MS., CU. MP Gamkleridze of the floor of the Congress with the statement disperse peaceful unauthorized rally in Tbilisi on April 9 (synchronous) - MS., CU. The commander of the Transcaucasus Military District, Colonel General Rodionov poses at the Congress his version of events in Tbilisi (synchronously) - MS., CU. MPs listen, react violently - MS., CU. Away from the courtroom delegation Baltic republics - MS., PNRM. Demonstrations in the Baltic republics against the Molotov-Ribbentrop Pact, the people holding banners, national flags - LS. Baltic Chain protest against the Molotov-Ribbentrop Pact. Residents of all communities of the Baltic republics from Tallinn to Vilnius build a chain in the streets, highways, etc. - Various., PNRM. Meetings in the capitals of the Baltic republics and other cities - MS., CU., LS. Against the background of passing freight trains - meetings and demonstrations - MS., CU. Female members of the Lithuanian Pruskene of the floor of the Congress (on the right of the republics to independent farming, etc.) (synchronously) - MS.
Baltic Chain - MS., LS. NA deputy Kraiko with rostrum contact the representative of the Baltic republics to declare that Russia is not to blame for their problems, etc. 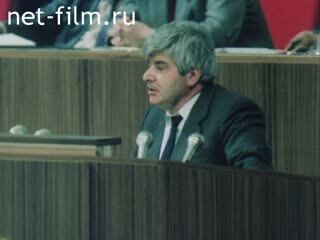 (Synchronous) - MS.
Mikhail Gorbachev calls for MPs to be allowed to speak deputy Sakharov (synchronous) - MS.
Deputies in the hall noise, Gorbachev strives with MPs (synchronous) - MS.
Sakharov on the podium, he's not allowed to speak - MS.
MPs vote for the provision of speech Sakharov - MS., LS. Gorbachev count votes (synchronous) - MS.
Sakharov speaks with critical remarks on the results of the congress (synchronous) - MS., CU. 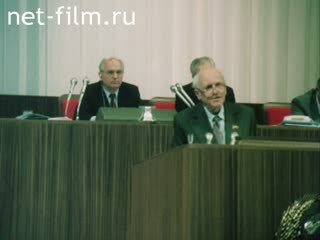 Gorbachev interrupted Sakharov (synchronous) - MS.
MPs applaud Sakharov many faces - LS. MPs on the sidelines - LS., PNRM. MPs V. Yaroshenko and Yuri Chernichenko the sidelines are interviewed (synchronously) - CU. 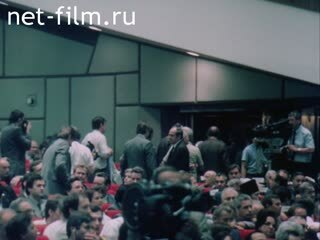 Deputies in the hall talking, talking with Gorbachev, the deputy at the microphone, the deputy asked for the floor - different.